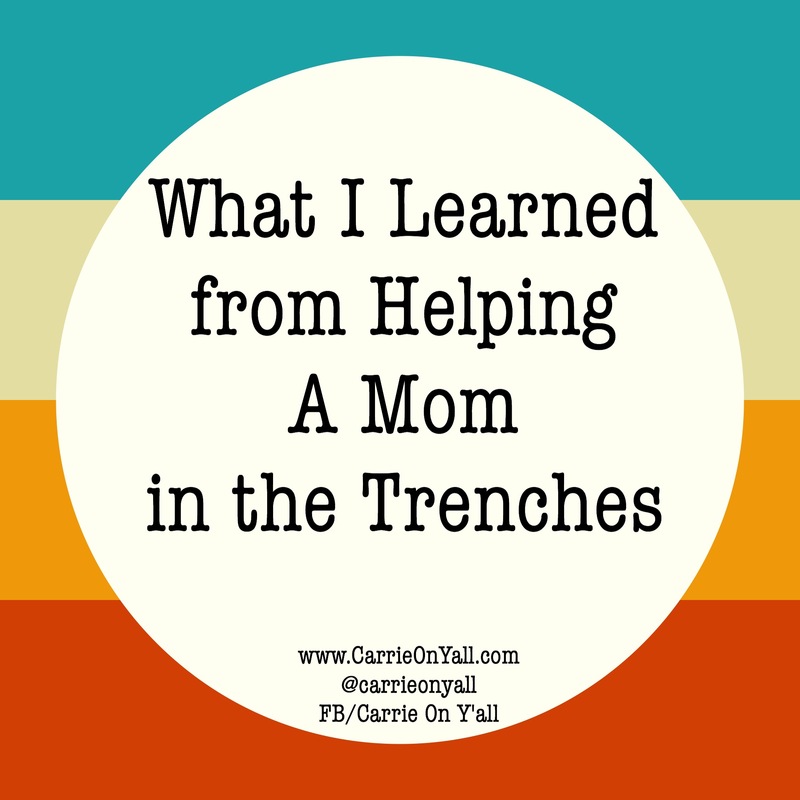 The other day, I helped a mom who was a stranger, a mom in the trenches. We were at a play place, and she was wrangling two little boys. Her older boy was about two years old, and she had a baby in her arms. While holding the baby, she tried to help her toddler into a high chair for his snack, which wasn’t working for any of them. I hopped up from my coffee with a friend. “Can I help you?” I asked. She was visibly relieved. “Can you hold the baby? I’ll get this guy into the high chair,” she said, and without an ounce of hesitation, she handed me an 8-week old boy whose hair smelled exactly like heaven. He snuggled into me, and for the first time in a LONG time, my ovaries twitched just a bit. “Thank you, thank you, THANK YOU,” she said as I handed back her baby. She began cutting food into small pieces for the toddler. “Of course! I’ve been there SO many times. You’re doing great, Mama,” I said as I rejoined my friend. My 3yo was playing happily with other kids, running, climbing, and occasionally yelling, “Watch this, Mama!” as he jumped or threw a toy, or slid down the slide, totally independent of me. I smiled and waved at my littlest guy, the caboose of our family who is no longer the tiny baby he once was. For my three kids, long gone are the breast-feeding days, the days of baby food and high chairs, the days of blowout diapers, the days of spit up. The only times I’m up in the middle of the night now are when someone is sick or had a bad dream, and they rouse me out of a deep 7-hour sleep. Right now, you moms of littles may envy me, and that’s okay. In the same way, I envy the moms whose kids are old enough to leave at home for a quick trip to the grocery store without Armageddon occurring. And some of you moms of older kids may just feel nostalgic for the good ole days, gazing back upon them with the rose-colored glasses that only time…and not changing 10,000 diapers a year… can give you. That’s okay, too. 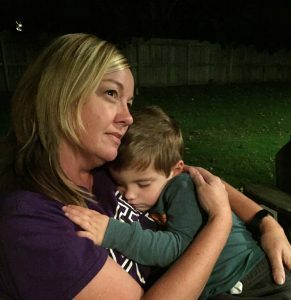 This is my friend Tracy holding our Sawyer while he slept. Though her two boys are older now, she still loves to hold a sleeping little one. As I sipped my coffee and occasionally glanced at the mom I’d helped, now breastfeeding her new baby while helping the toddler eat small pieces of cheese, I knew I’d not yet developed the rose-colored glasses. Those little boys were adorable, and they reminded me of my own two little guys who are about the same distance apart. Three years ago, I WAS that mom, and I accepted every last offer of help because parenting kids, especially kids that little, is HARD. You want to hold my baby while I take a moment to relax? Sure. You’ll take my toddler to the bathroom while I breastfeed? Thank you. You picked up extra food because you knew my husband was on a business trip? God bless you. These days, I vividly remember being in the trenches. The trenches weren’t that long ago…heck, on some bad days, I trick myself into thinking I’m right back in them…but I’m not, not really. I sleep. My kids potty by themselves. They’re reasonable most of the time. I’ve traded the terrible twos and threenagers for impending tween drama and driving everyone to sports practices. But you moms with the littles? I still see you. I wish you well. I hope you know you’re doing great. Even on the days that aren’t so great, I hope you’ll free yourselves from the agony of comparison to other women because we all have our own messes to deal with. I hope you know these days won’t last forever, in some ways you’ll miss and in other ways you’ll never ever miss, even with rose-colored glasses. Thanks for letting me help you. Whether we’re friends or strangers, we are bonded together as women who love our kids, who’ve been in the parenthood trenches at one time or another, and who realize that parenting takes a village. I’m honored to be part of your village, even if it’s only for a few minutes.